Me: Let’s see…what was my password to log into WordPress? First Try: Type type type type….Nope, that isn’t it, let’s try another one. Second Attempt: Type type type type…..
Crap, this is what I get for leaving it so long between posts. Third Attempt: Type type type type….. Yay! I’m in! 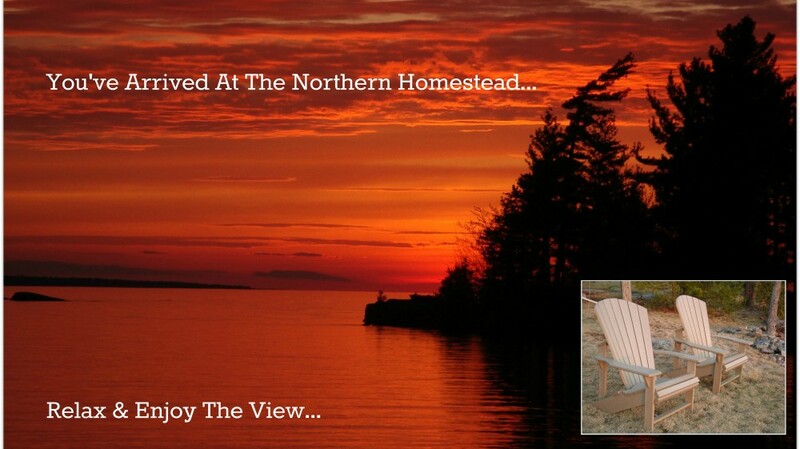 As for my audience here….have you missed me? I sure have missed y’all (typed with a southern accent, make sure you read it in one). It has been an insanely busy Spring that launched headlong into Summer. So busy that I haven’t had time to write my daily thoughts, ideas, creations or wonders of my world…or any world for that matter. Until today ~ Consider this your early Christmas present. The way things are going, my next post may be on Boxing Day. So back to the headline above…. Summer Bounty is exactly what it is. I have been picking cherry tomatoes up to my eyeballs the past couple weeks and the Serrano peppers are all but leaping off the plants into the pickling pot. I have harvested my garlic that was planted last fall and have around 40 large bulbs hanging in the garage at the Homestead drying. Soon they will be put into my yummy Spicy Homestead Pasta Sauce once the Roma toms are ready. I have dried armloads of Oregano and the chive plant sprouted pale purple puffball flowers which I let go to seed to harvest. The carrots need a weekly trim so that they don’t block the sun for the pepper plants while the fuzzybutts and honey bees are busy collecting pollen in the wildflower gardens. I love this time of year when there is so much colour in the yard. What I don’t love is getting stung by a wasp while mowing the lawn a couple weeks ago. My foot swelled up like a balloon for 3 days. I since found their nest (in the ground, I know, never would have thought to look there!) and we are attempting to evict them… not so easy apparently. House renovations are winding down, thank &*%#@!!! I almost applied to be on either Mike Holmes or Bryan Baeumler’s show…titled “How to do a new bathroom install IN-correctly”. After a few weeks of fret, worry, cursing and drinking myself into a stupor, the new bathroom is now complete and works as it was designed to. Mental note – do NOT try to install a new bathroom and renovate an existing bathroom at the same time. It is not worth the loss of your sanity. We have a few things left to do, but the big indoor jobs are done. Outside awaits 150′ of 10′ high cedar hedging in need of a little of the top and sides. I may contract out that job to save hubby from being worked to death. Now this is the most exciting part of this post ~ FIBER THRILLS! 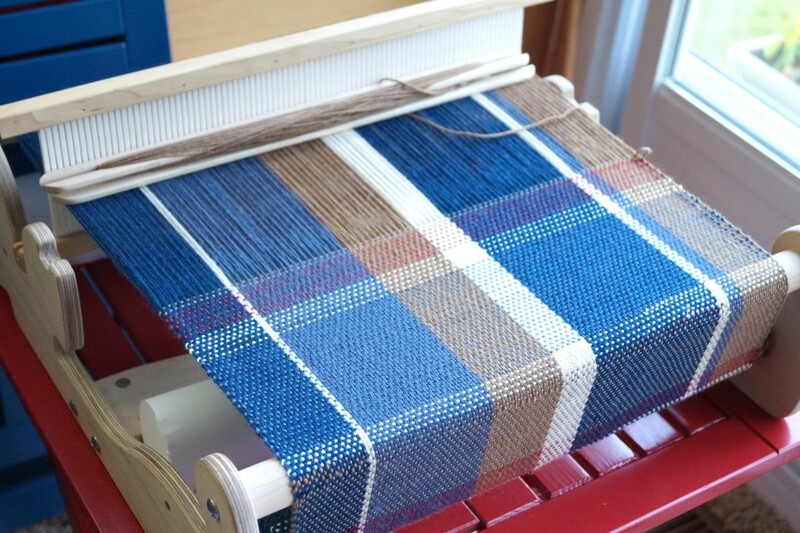 I have managed to squeeze some time out of my very busy days for knitting, spinning and weaving. 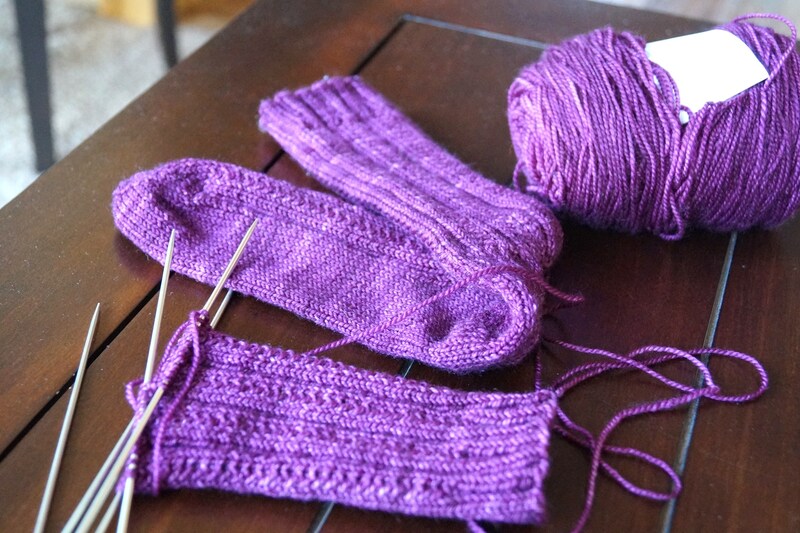 I have completed about 4 pairs of socks in the last few months and currently have a gorgeous purple hued Madeline Tosh merino wool on the needles that hopefully will be done this week. I also warped up the little Cricket loom with a faux Burberry style scarf made from some sock yarn stash, which didn’t come without its complications and me almost pitching the Cricket into the lake after a warping fiasco. 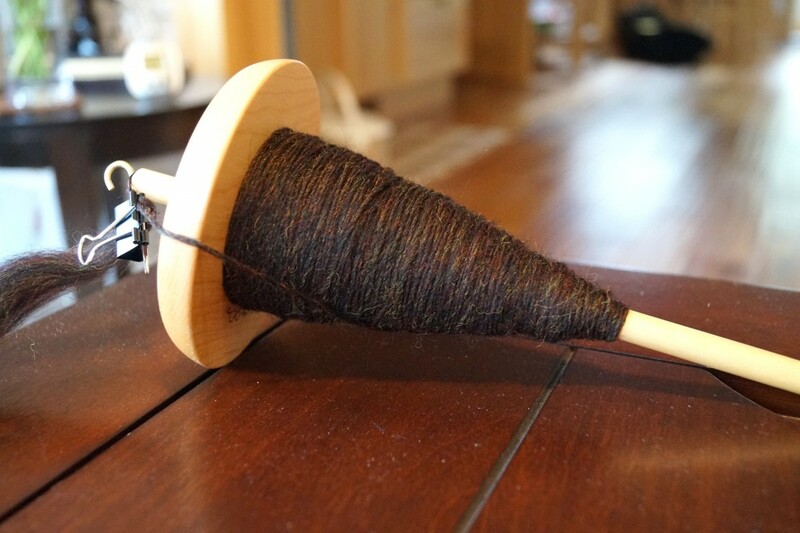 But what I have really been concentrating on is getting better at this new spinning thing. Man, talk about total delusion with oneself for what seemed an eternity. 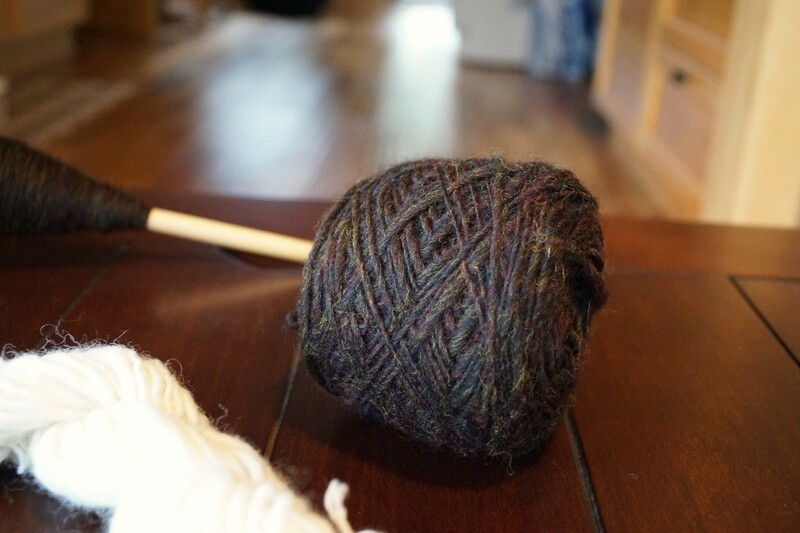 I am now at the point where I can say I have actually spun USEFUL yarn! Here is my first attempt: (Don’t laugh) Here is the Second Attempt: (ok, you can giggle a little) Here is the Third Attempt: (go ahead…you have permission to guffaw) Getting better right? Please tell me you see a difference? Here is my Fourth Attempt: (look in awe) Which is the longest amount spun of the four, this one at a whopping 130 yards! The others were all under 40 yards, and the first one only being 12 yards. This latest one is long enough and good enough to actually be knitted into something other than a potholder or a drink coaster. It will become a warm winter hat, which is about all you can use 130 yrds up with. Now this is what is currently on the spindle…. Pretty darn good eh?! I have finally been able to keep my consistency and it is a LOT thinner than the previous attempts. 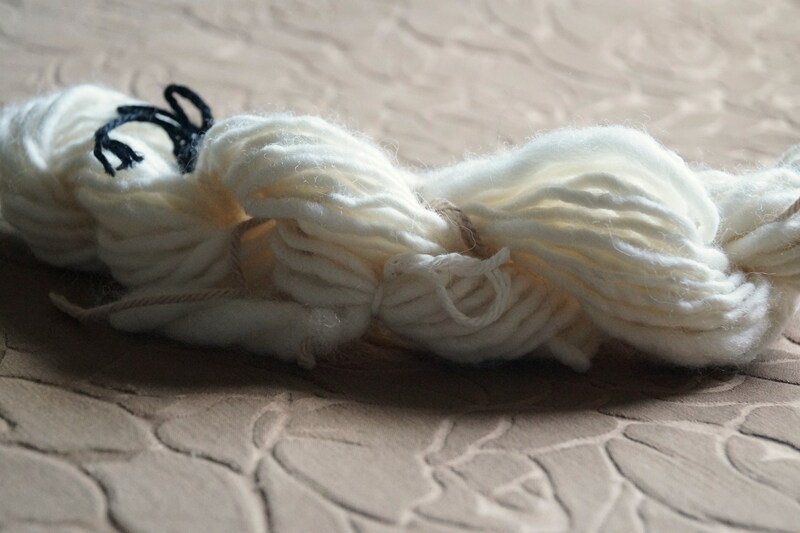 I guess practice does make perfect, even with some timeouts now and then for when it was acting up (it…the fleece and spindle, certainly not me). I will fill up the spindle, then transfer it to a bobbin and spin another spindle full then I am going to attempt plying for the first time. 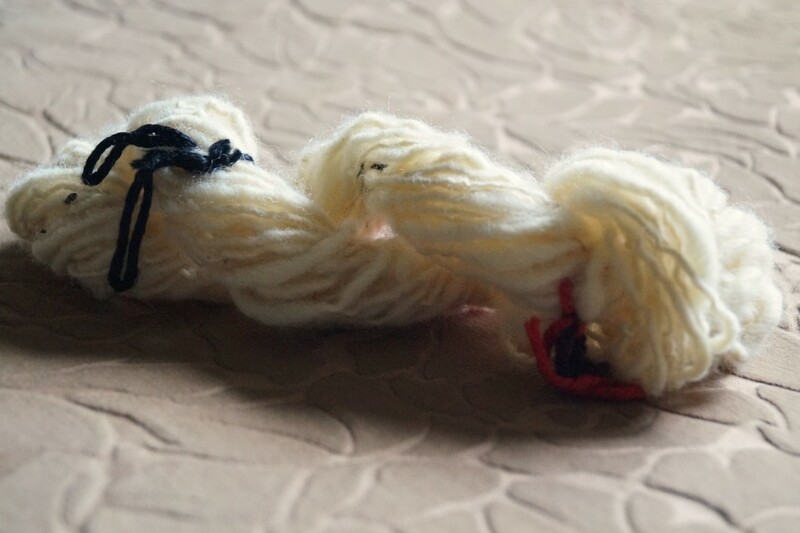 Plying is joining 2 or more separately spun single spun yarns into one yarn. 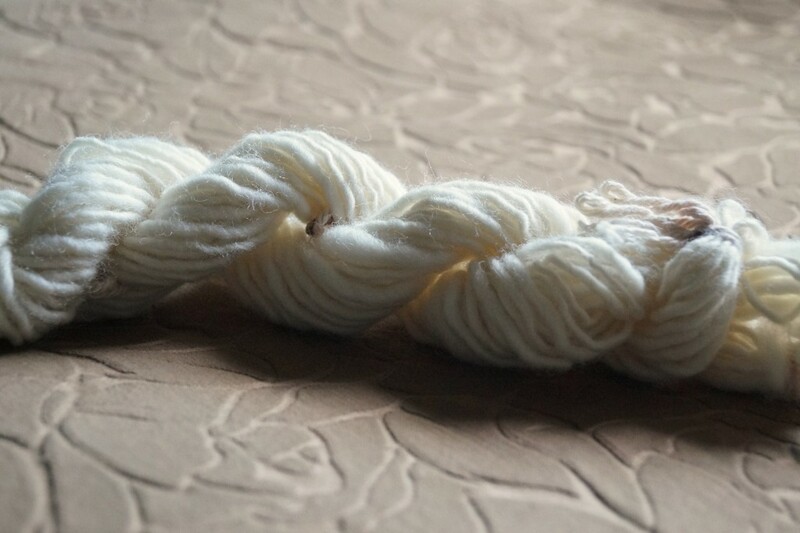 I have done my research and it all looks easy enough (emphasis on looks easy), they also say that plying yarns is magical, they take lumpy-bumpy singles handspun and make it look just like store bought yarn. We shall see if *they* are correct. I think I have babbled about everything I wanted to babble about this morning, but now it is time to head to the kitchen and thinly slice a whack of cherry toms and roast them in the oven until they are carmelized, which by the way, are excellent as a pizza topping. This entry was posted in Cottage Adventure, Entertainment, Gardening, Knitting, Weaving by Deborah. Bookmark the permalink. Wonder Woman has absolutely nothing on you. How on earth do you have that much energy? Keep up the work and hope to hear from you soon. Bravo! i didn’t laugh, giggle or guffaw once. i’m very impressed. nicely done. can’t wait to see the “ply” version. keep up the good work girl!